Main Applications: Swimming Pool Filter Gauge/Replacement Pool Filter Gauge/Pool Pressure Gauge, Plumbing, heating, air conditioning, pneumatic, water tanks, air compressors, OEM. 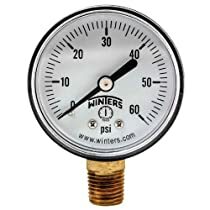 Most economical, all-purpose pressure gauge. CRN registered. Warranty: 5 Years. Dial: White aluminum with black and red markings. Case: Plastic. Lens: Polycarbonate. Bourdon Tube: Phosphor bronze. Socket: Brass. Movement: Brass. Working Pressure: Maximum 75% of full scale value. Over-Pressure Limit: 25% of Full Scale Value. Enclosure Rating: IP52. Accuracy: ±3-2-3% ANSI/ASME Grade B. Dial Size: 2” (50mm). Range: 0-60 PSI (Single Scale). Connection: 1/4" NPT Bottom Connect. Worked well out of the box and was inexpensive. That's all I needed since these things need to be replaced every couple of years - even the ones that cost three times as much. Works fine on my pool filter.